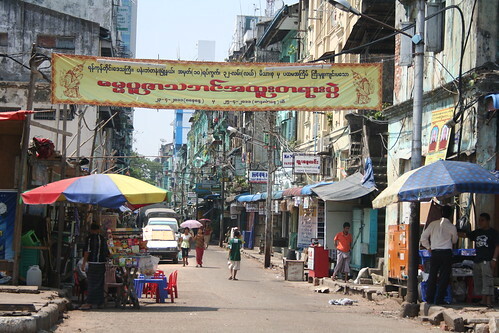 downtown street in Yangon, originally uploaded by Mister Wind-Up Bird. Yangan is decrepit. There’s almost nothing new anywhere, and what exists is barely being maintained. Blocks of concrete housing sit with streaks of black mold replacing long-forgotten paint jobs. Sidewalks are cracked and broken, exposing sewers and drains beneath. Taxis drive with shot suspension, broken windows and missing door handles. At night, their yellow headlights provide most of the illumination for a teeming downtown of sidewalk shopping and dining otherwise lit only by the occasional fluorescent light of a shop or temple. Like the rest of the country, the city seems like it’s in a holding pattern, a combination, I suspect, of the country’s isolation and poverty under the ruling junta and uncertainty about what could possibly follow. Along the waterfront are rows of massive, grand colonial-era buildings once occupied by the British, and later by the government of the military dictatorship. Then, in 2005, the generals arbitrarily built a new capital called Naypyidaw in the middle of nowhere and the government offices picked up and went. Now these buildings lay empty and boarded up. Despite their prime location and architectural beauty, nobody seems to have the resources or interest to turn them into offices or hotels. So, they wait, too. But this doesn’t mean Yangon has forgotten how to party! Life may be hard and the future uncertain, but the Burmese are hardly a dour people. We arrived the first day of Thingyan, the four-day Burmese new year, and were soon after joined by Janelle’s fun-loving old school chum Mark, who we had been hanging out with in Bangkok where he’s living the expat life working a prestigious job for a prestigious company I won’t say the name of here. During Thingyan, the Burmese spend four days drinking, eating, dancing, and dousing each other with water. Actually, “dousing” doesn’t quite cover it: during Thingyan, the buckets and hoses come out in full force, and Buddha help you if you want to stay dry. Our introduction to Thingyan came when we got into a taxi with every surface covered in Scotch tape and plastic sheeting, and almost immediately a pickup full of teenagers pulled up next to us and a good ten liters of water was suddenly tossed into the windows directly onto our laps. That was pretty much the end of our being outside the hotel and dry simultaneously. On the last–and wildest–day of Thingyan, Mark was able to get the young concierge of our hotel to spend a few hours of his day off to hang out with us. He took us to party central, where huge temporary stages full of young Burmese take hoses to hand and drench other young Burmese who cruise by in the backs of old Japanese flatbed trucks. On the street, people drink and dance as Burmese hip-hop and Lady Gaga are blasted through concert speakers. The whole experience is decidedly more music festival than religious ritual. Very few Westerners take part in this part of the Thingyan festivities. I think we saw maybe four or five in total. We were certainly not unwelcome, though! Apparently, dousing the round-eyes is great fun. Everybody wanted to throw water on us, bust a few moves and then shake our hands and throw out whatever random English phrases they had at their disposal. A group of girls insisted on all kissing Janelle’s cheek, and we almost lost Mark when a crowd of teenagers grabbed at him trying to shake his hands despite the fact a firehose was simultaneously trained on his face. But our friend the concierge kept us safe and all together, and negotiated beer and taxi prices for us. In exchange, we bought him all the Thai beer he could drink (a lot, it turned out) and, I’m sure entertained him with our mixture of cluelessness and enthusiasm. I suspect without Mark and the concierge we wouldn’t have done it, which would have been a shame. It was really an incredible feeling, walking the streets of Yangon at ten in the morning with a beer in one hand and a gaggle of Burmese teenagers trying to shake the other, while hoses blast you with cold water and truckloads of cheering partiers trundle by beside you. Lemme tell you, if you suffer from low self-esteem, being a foreigner at a Yangon Thingyan will fix you right quick. Main Street, Burma, originally uploaded by Mister Wind-Up Bird. “I do not like H-A. Very sorry, do you have anothers?” We were in the tiny office of a Yangon black market money changer. Two paperback-sized stacks of thousand kyat notes lay on the table in front of us. We had agreed on a rate, walked in 40-degree heat to our hotel to fetch two mint-condition $100 US bills we had brought from Thailand, and delivered them to the money changer. Now he was refusing to accept them because he didn’t like the serial numbers. “No, we do not,” I said, with more than a trace of exasperation. Janelle made a sputtering sound. US dollars are widely used in SE Asia alongside the local currency. In Cambodia, they are even dispensed by the ATMs. But Burma is different. Burma has no ATMs, no credit card readers, no international banks, and the official exchange rate is a fraction of the black market. You have to bring in all the US dollars you will need as cash, plus extra for emergencies, and exchange at whatever rate you can negotiate. To make it even more frustrating, the tiniest rip, dye mark, stamp, or even crease and the bill will be politely but firmly refused. As, apparently, will bad serial numbers. We had heard that CB- prefixed bills had been counterfeited by North Korea, but HA? More counterfeiting? A ploy to distract us? Indo-Burmese superstition? Who knows? Not letting things like this get overshadow the positives is important. The Republic of the Union of Myanmar is poor, isolated and supremely fucked up, but also stunningly beautiful and incredibly charming. Taxi drivers wear traditional longyi and take their hands off the wheel to give a wai gesture toward temples as they zip by in rattling 30-year-old Toyotas. Westerners are stared at in the street, but smile and wave and you usually get a wide grin back. Astrological omens dictate the government spends hundreds of millions to move the capital to the middle of nowhere, and the devout have covered religious monuments in billions of dollars of gold, but the country’s largest city goes without street lights. Meanwhile, the countryside continues as it did decades, if not centuries ago, with rice planted by hand, fields plowed by ox, and horsecarts taking tribal people to market. It’s all seriously National Geographic. We’re back in Bangkok, a 90-minute flight from Yangon that propels you 40 years ahead. I have tons to say about Myanmar/Burma, though the next couple of days are going to involve running errands and traveling, so it may take a while to get it out of my notebook and onto the haiku factory. But sit tight and you can hear how we got to be treated like rock stars in Yangon, saw the thousands of stupas of Bagan by horsecart and cruised through the stilt villages and floating gardens of Inle Lake, easily one of the most incredible places we’ve ever been. Well, it’s certainly not the easiest visa process in the world, but we have gained admittance to Myanmar, catching a flight there in a few hours. Just in time for Burmese New Year in Yangon with our friend Mark. Should be off the hook! Internet is, apparently, pretty restricted. Probably none of the ubiquitous free wifi we encountered in Cambodia. So the blogging and emailing might be a little slower until we return to Thailand on April 27 (or later if we extend our stay). But, you know, I’m sure everything’s fine. Cure for the Homesick, originally uploaded by Mister Wind-Up Bird. We’ve been traveling exactly 7 weeks now. Not very much time, but it already seems kind of normal. We know a few things now, just enough to make it easier. How to deal with touts and beggars. How to find a good guesthouse in an unfamiliar town and when to book ahead instead. The nerve-jangling ordeal of crossing a busy street. We’re starting to learn when to haggle and when it’s just not worth trying to squeeze a couple of bucks out of someone will never make in a year what I can make in a month back home. And, of course, the art of glancing at the sidewalk in front of you long enough to not step in anything unsavory, but not long enough for the nature of the unsavoriness to sink in. As we get more comfortable, home seems further away. I was looking at pictures on flickr yesterday of British Columbia spring, and I was filled with the sense that Vancouver suddenly felt as remote to me now as Bangkok had felt a few months ago. Except that Vancouver was home, while Bangkok was still alien. Fortunately, there are ways to reconnect. 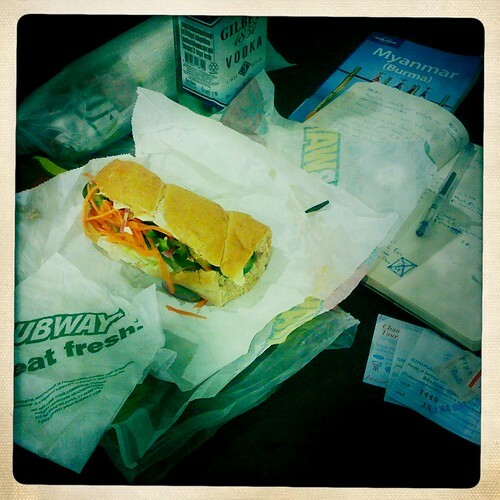 Today, we went to an English-language film (Source Code) and then got Subway for dinner, for the second night in a row. Subway is not popular with Thais–I’m sure the fact that prices are the same as Canada/Australia has something to do with that–but there are a handful in the touristy malls and expat neighborhoods. Now, I don’t love Subway, but for the past decade I’ve eaten it on a pretty regular basis. So even though I know full well that better food is available much more cheaply, I really enjoyed my six-inch tuna with extra olives and mustard. Also, spirits are cheap here, and they help put the day’s frustrations and alienation into perspective nicely. The marginal utility of drinking is a lot higher here, is what I’m saying (sorry, once a nerd…). All that said, though, we’re enjoying our travels immensely. I mean, it literally took years of planning to make it happen, but it still seems incredible that we can just… do this. The sacrifices are so minor. A little bit of work and the accident of being born into a couple of the wealthiest societies in human history, and we get to be able to see the world this way. How is this allowed? It’s gonna be hard going back to a more structured life after this, lemme tell ya. 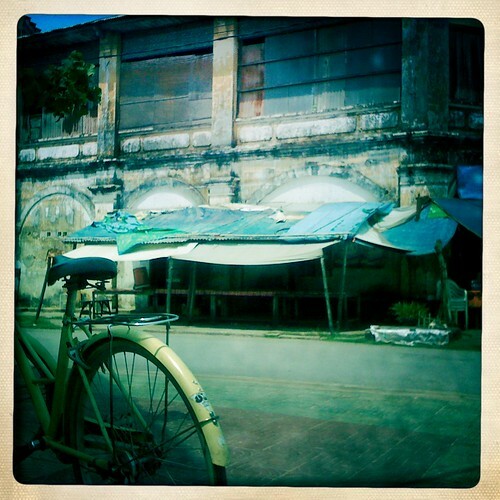 Pleasantly Post-Apocalyptic Kampot, originally uploaded by Mister Wind-Up Bird. Kampot has a pleasantly post-apocalyptic feel. Cambodian women in pink flannel pyjamas bicycle silently past blocks of crumbling French architecture. Decades of neglect, haphazard repurposing and jury rigging have transformed the colonial shops and villas into something odd and transient. A few travelers sit in wicker chairs in front of a coffee shop–nearly the only business open on a wide, leafy boulevard–eating baguette sandwiches and drinking iced Vietnamese coffee. Early 00s electrolounge plays in the background. The music’s good. The coffee is excellent. If we were approaching the end of days, I would want to run down the clock in a place like this. The rest of the world seems very far away. The community of foreigners here this time of year are oddballs and misfits, long-term travelers and burn-outs. Our guesthouse is run by an amiably stoned Scottish(?) electronic musician with an accent it takes all our concentration to decipher. We met a German girl who announced “I have no social skills!” as she squeezed into the sofa beside us and launched into a meandering story involving automatic motorcycles and her Cambodian dog. A lot of people here seem to be here to get away from somewhere else, even if it’s just cooler-than-thou backpackers stepping off the regular trail without leaving their Lonely Planet Cambodias behind. But somehow that makes it even more interesting than a place that has a reason to be a destination. You could hide out down here a long, long time before the real world ever found you. And nobody would even think it strange. We rented bicycles today to cycle through the town and countryside of palm trees and dry rice paddies. I think it made us a bit of an oddity: once out of the town center, every single child we encountered wanted to wave to us and try out their English, mostly by shouting as we biked past. “Hello! How are you? Hi! Where you go?” It was, to be honest, incredibly charming. Unfortunately, we can’t stay in Kampot long, and things are changing so rapidly in Cambodia, I have no idea if it will have the same vibe in a few years. Coming here was a bit of a spur-of-the-moment thing, but I’m really glad we did. And now I know where to escape to if I’m ever on the run.